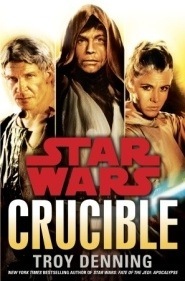 Troy Denning has written a bunch of really solid Star Wars books in his career, Crucible is not one of them. This book is easily the worst Star Wars book we read all 2013 (finished NYE), with little direction, point, plot or real energy. The writing is poor and clealry is rushed and uneditted to the point where we were skipping over entire paragraphs of garbarge that felt like they were there just to meet some arbitrary word count. Sure it’s neat to see Vestara Khai again, though her role here is a bit muted and our regular cast of character, Han, Luke, Leia are all now apparently going to take a break of some sort…. Though given that Luke was on hiatus from the Jedi Order and Coruscant for much of the Fate of the Jedi series, he’s ‘away’ more often then not. Overall, a waste of time. Hi there, There’s no doubt that your blog could bbe havihg browser compatibility problems. it’s got some overlapping issues. I merely wanted to give youu a quick heads up! Star Trek USS Enterprise NCC-1701 2009 Movie Playmates WORKS!